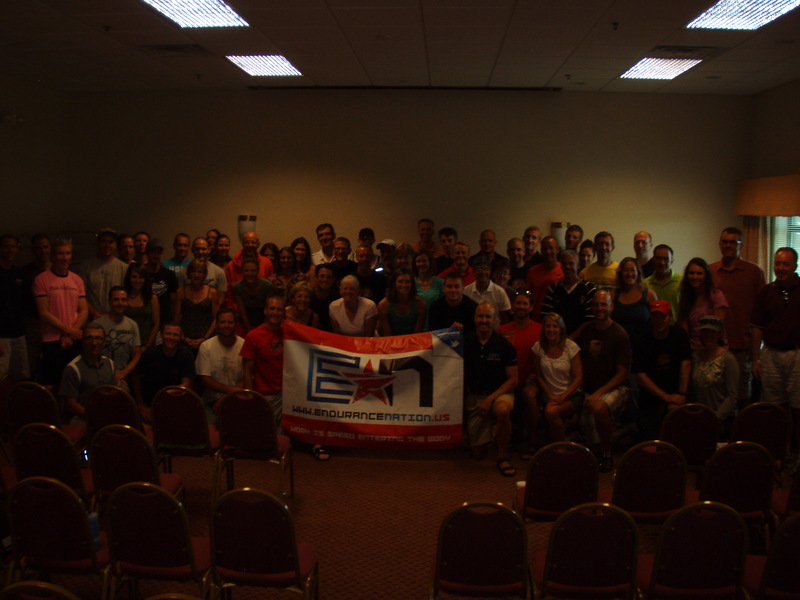 Coach Rich led our final tri-rally of the 2011 season on the Ironman® Wisconsin course, July 28-31st. Rich was joined by over 110 (!!) athletes, both TeamEN members and the public. Thursday, July 28th — Introduction and the Four Keys of Ironman® Execution: Ironman® Wisconsin version. Rich introduced everyone to the intent of the camp and then quickly hit our Four Keys of Race Executionbefore drilling those down to their specific application on the Ironman® Wisconsin bike and run courses. Armed with the Four Keys and their application to the Wisconsin course, the campers hit the bright and early Friday morning, for a 70-108 mile ride of the Ironman® Wisconsin followed by a 3-6 mile brick. Then in the evening, Rich debriefed the campers on what he had observed from their rides and discussed “advanced” Ironman® race execution topics — proper gearing and bike setup for IMWI, descending, cornering, race day nutrition and hydration, and much more. The campers went out again on the bike run courses Saturday, applying and refining everything they had learned over the previous two days of training and discussion. In the evening Rich discussed how he and Patrick organize the training of their team of over 500 long course athletes. In short, there’s what you read or learn in a book, there’s what you learn when coach maybe 15 athletes per year for a couple years…then there’s what you learn when two coaches coach themselves and race 25 Ironman® finishes between them, have coached thousands of age group Ironman® athletes for a combined 18+ years, and currently lead a squad of over 500 long course triathletes. After the discussion about 55 campers joined Rich at Gray’s Tied House in Verona for a camp dinner. On the final day, Rich assembled the campers on the top deck of the Monona Terrace to discuss the layout of the swim, the transition area, and answer any final questions. The campers then set out to run one loop of the Ironman® Wisconsin run course. Athletes were encourage to put their heads into the course, just as in race day, and practice our run/walk strategy discussed here. Another successful end to our third tri-rally of the season! The cost of the camp? $25. Yep, 3+ days of training, over 4.5hrs of discussion, and incredible group learning opportunities for the sum total of $25 per person. Just one more example of how Endurance Nation is committed to fundamentally changing the triathlon coaching, training, and racing game! Interested in learning more about Endurance Nation Triathlon Coaching? Sample one of our many FREE virtual seminars or create a FREE 5-day trial membership today!